I grew up in a house with a shortage of seasons. Despite daily compelling evidence outside our front door for the existence of four seasons, we were annually restricted to three. As the son of a high school teacher and coach in Philadelphia, I became accustomed to a seasonal rhythm which confounded all the well-intentioned lessons I’d received in kindergarten regarding winter, spring, summer and fall. In our house it was Cross Country, Indoor Track and Outdoor Track. Each of them had their own allure, but it was always the undercover campaign which quickened the pulse and thrilled the senses. If cross country was rolling and expansive, indoor track was thrumming and immediate. If outdoor track was bucolic and languid and sun-splashed, indoor track was close and contained and claustrophobic. If cross country was a stream of runners crossing open fields in a succession of mud-caked calves, indoor track was elbows angled into rib cages and a succession of spike-nicked shins. If outdoor track was scattered grandstand laughter and an encampment of team tents and a starter’s pistol sounding somewhere up the track, indoor track was pressing partisan crowds and the rapidfire slap of sprinters decelerating into upended pole vault pads. It was riveting displays of power in close proximity. Attempts at explanation were frequently fruitless. Indoor track was then, and is now, a creature of an entirely different stripe. And unless you’ve tumbled out of a bus at 7:30 on a wintry Saturday morning, blowing lung-warmed air across your closed fists, watching your breath condense in the still-dark sky, unless you’ve shouldered your gear bag and marched into a nearly empty fieldhouse for a nine-hour meet in which you’ll be competing in a single event, you may not understand. You may not understand that indoor track is not simply outdoor track on a smaller oval. That it’s not the same familiar roster of events, with less space and no wind. Not merely tighter curves and shorter straights. Not simply a nice way to pass the winter, in from the cold. It is a one-ring circus, a barely-contained big top, bursting at the seams. Indoor track is the smell of sweat bonded to Ben-Gay. It is the scent of stale air and mildewed rubber mats and sneakers fresh from the box. It is the tang of aging athletic tape mixed with concession stand hot dogs. It is forced-air heaters high in the rafters and lemon-lime Gatorade and warm pretzels and wafting chalk and trashcan vomit and lingering flatulence and rusting beams. It is the stench of exertion blended with the odor of exhaustion. 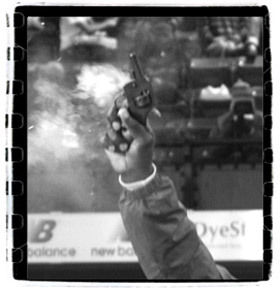 Indoor track is the bouncing ping of a fumbled baton and the muffled thud of a 12-pound shot crashing into a sector pad. It is the clatter of a vaulting pole finding purchase in a metal box, the tinny squawk of the clerk’s microphone, the cascading crunch of clipped hurdles. It is the roar of a close relay race and the rhythmic clap of a last-gasp long jump attempt. It is the primordial grunt of a triumphant weight throw and the hushed settling of legs into starting blocks and the sewing machine-clatter of quarter-inch spikes on banked wooden boards. Indoor track is the dedicated fans, packed into every corner and crevice of the building. Loud and raucous and rambunctious and restrained. Civil and irreverent at once. Piled six deep onto rollaway wooden bleachers and precarious railings and tottering aluminum trackside grandstands. A slice of humanity as diverse as any audience at any event you may ever attend. Folks from different races and neighborhoods and tax brackets existing side-by-side in harmony, yet fiercely loyal to their teams. A mass of trash talking, elbow-ribbing, fist pumping, shoulder-shoving enthusiasts. Dishing out high-fives and back slaps and knuckle daps and finger snaps. Black grandmothers hugging white soccer moms on the strength of a single deft baton exchange. Two old men huddled together in the nosebleeds, arguing splits in broken English. Bankers and cab drivers and coaches and custodians and lawyers and house cleaners and boyfriends and sisters and aunties and track nuts and teachers—all massed together in mutual appreciation of the sport. Indoor track is the performances on the floor. The kid coming off the far turn with a guy on his shoulder and the blood in his cheeks and the cotton in his throat and a half lap to go. The high-wire pole vault act and the high jumper pouring like molasses over the bar and the fully extended triple jumper. The prestidigitation of a perfect baton pass in a traffic jam of leadoff legs. The roaring shot putter bombing the far reaches of the sector. The girl finding one more gear on the backstretch. It is the moment when weeks of practice collide with a sliver of opportunity to transform the simple act of self-propulsion into something closer to sublime. Indoor track is the old timers. The starters and the turn judges and the implement weighers. The lap-counters and the hand-timers and the standard-adjusters. 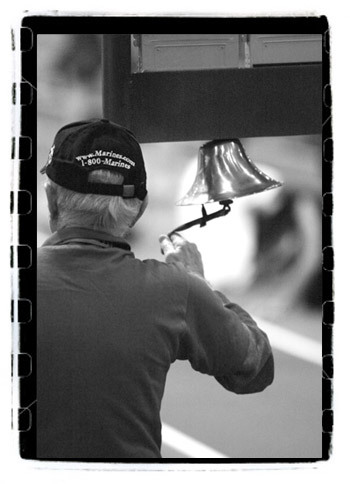 The old fellow curling his arthritic hand around a dangling bell string to signal the final lap, the rope ridges matching the skinfolds of his palm with perfect familiarity. The elderly woman squatting through her chronic knee pain to retrieve the fallen high jump crossbar and replace it, one more time, on the towering standard. The three gentlemen squinting down the straightaway with glaucomic eyes in anticipation of the dashes, their leathery thumbs perched above timeworn stopwatch buttons. The dedicated folks who remember when all the records were maintained in yards, when the high jumpers landed on sawdust and the track itself was oiled-down dust. They know all about the shortage of seasons. 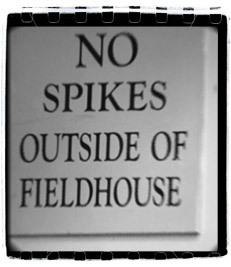 They understand the difference between indoor track and outdoor track. The allure of each. The power of the thrumming and the closeness. Their efforts are buried in the memory of countless Saturday mornings, folded into the history of a thousand Friday nights. Their sweat is vested in the boards. 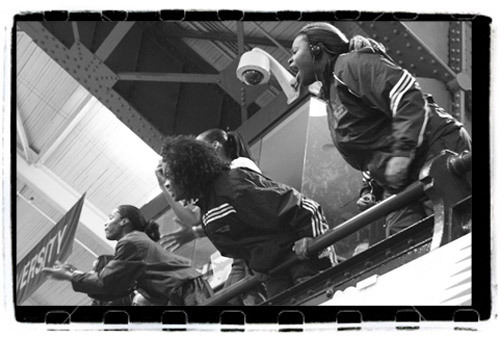 Their voices echo in the rafters, calling athletes again and again to the starting line. Week after week. Month after month.